At last the event you've all been waiting for, coming to you from the North Shore Wargames Club on the sunny North Shore of Auckland! *Snapshot on the Shore* : 3 games of Late War Flames of War. Location: Forrest Hill Scout Hall, Becroft Park, Becroft Drive, Forrest Hill. Time: Sunday November 30th. Looking at 8.30am rego for 9.00am kick off. Format: 3 Rounds - 1600 Late War (all official lists including PDFs) - Swiss chess draw. For the first round I will attempt to line up people who don't regularly play each other. Due to space considerations there will be a limit of 16 players. Get in quick, lists due by 23rd Nov or else. Terrain contributions for a couple of tables will be greatly appreciated. Prize support from NSWC and the generous folks at Battlefront. Respect of your peers and defeated opponents = priceless! 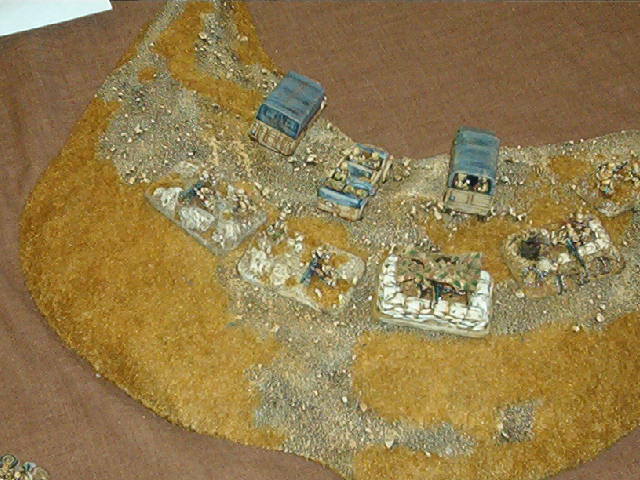 Left: A Flames of War game played at Natcon 2006 between Rob's NZ infantry and Kit's Early War French army. 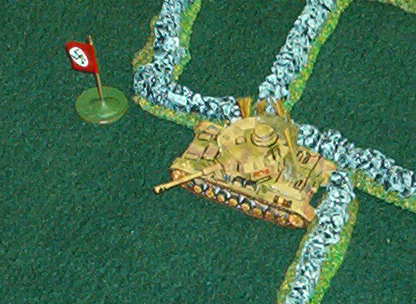 WWII gaming has long been a part of the Club with 1st Edition WRG being the mainstay of the club since the Seventies in 1/72nd scale. WRG 2nd Edition is still being played now and then in 1/72nd. 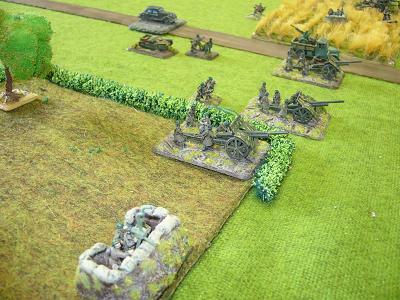 15mm has taken off at the club with the efforts of Battlefront and Flames of War is played primarily, with Rapid Fire also having some appearances. You'll often see Battlefront staff and playtesters here at the club. Kit's award winning Early War French Army. 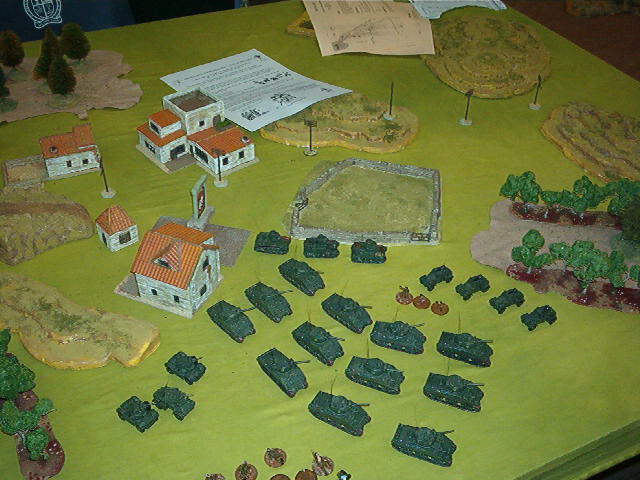 A Flames of War game at the club. 5000 points per side, Brett Jerries, Rob British. 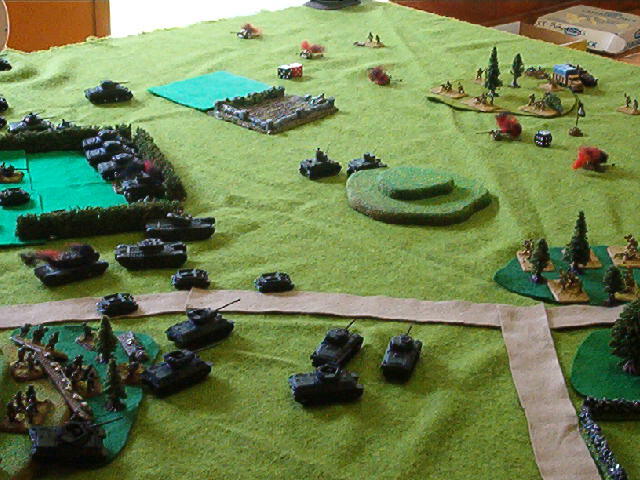 The smoke is the Germans' Pak front, lurking off screen waiting to stall the British tanks are three Panthers and two Ferdinands, most of the British tanks visible are destroyed, however the British Infantry take the day on the opposite flank as tankers distract Jerry. Wayne's Award winning DAK force from NATCON 2004. 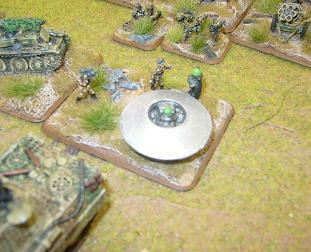 Wayne received best painted WWII and best painted for NATCON. 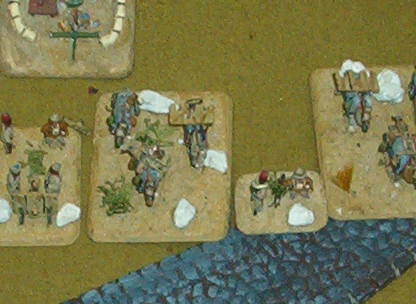 Colonial Italian Camel Artillery from Kit's NATCON 2004 Flames of War Army. Models converted from Battlefront, Essex Miniatures and Minifigs. 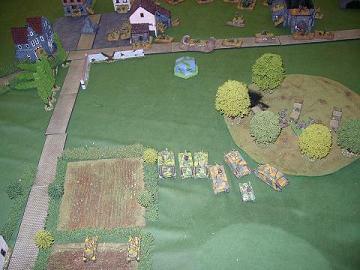 Von Goldsbury sitting on the Objective after changing flanks, the Panthers took out the Churchills, but lost one of their number to a Carrier Platoon's Piat!! !